Ever since the discovery of blood types early in the last century, transfusion medicine has evolved at a breakneck pace. 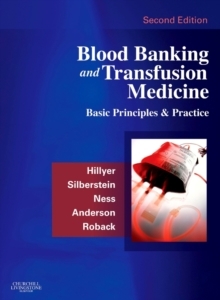 This second edition of Blood Banking and Transfusion Medicine is exactly what you need to keep up. It combines scientific foundations with today's most practical approaches to the specialty. From blood collection and storage to testing and transfusing blood components, and finally cellular engineering, you'll find coverage here that's second to none. New advances in molecular genetics and the scientific mechanisms underlying the field are also covered, with an emphasis on the clinical implications for treatment. Whether you're new to the field or an old pro, this book belongs in your reference library. Integrates scientific foundations with clinical relevance to more clearly explain the science and its application to clinical practice. Highlights advances in the use of blood products and new methods of disease treatment while providing the most up-to-date information on these fast-moving topicsDiscusses current clinical controversies, providing an arena for the discussion of sensitive topics. Covers the constantly changing approaches to stem cell transplantation and brings you the latest information on this controversial topic.